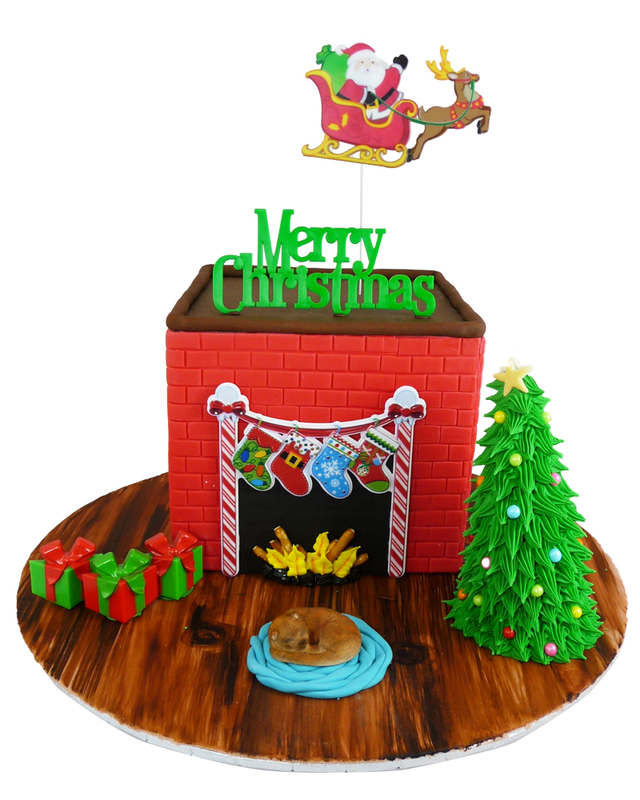 Jayden whipped up this fun cake to show off some of the neat Christmas products we have in this year. Many of these are old stand bys and create a nostalgic feel for your Christmas baking projects. Jayden covered a round cake board with rolled fondant. Once the fondant had hardened she used Americolor - Chocolate Brown food colour and using a dry brush technique painted the fondant to look like a wood floor. Icing Christmas trees are easy if you use an upside down icecream cone as a base. Jayden used a #18 star tip to ice the Christmas tree and then decorated it with pressed sugar stars and candy beads. To create the brick effect Jayden rolled out Red Fat Daddio fondant and used FMM's Brick and Treebark Impression matt to create the brick pattern. The Stocking Banner Layon Topper was used to the easily add the Mantel and stockings. Sleeping Cat was made with our sleeping cat silicone mold and it is sleeping on a braided rug made of rolled fondant.